Ah, startups. The center of innovation. The nexus of art and science. Or are they? Sure, we see stories about young energetic companies working on cool ideas in the next big app. We all swarm to the newest social network. But what’s the real goal for these companies? A simple, newer, more marketable version of the latest fad game or other mobile diversions? Where’s the real mission for these companies? How do these small innovations help mankind? Are these new companies solving problems? Bettering humanity? Helping us learn? Helping us live healthier lives, be stronger, more resilient? Or even, just be better people? As evidenced by the 2014 TechCrunch Disrupt event in San Francisco, those types of big ideas might all but be abandoned by the startup community. In the Startup Battlefield event there, only a small fraction of the contestants were startups focused on health, social issues or anything non-frivolous. This year’s winner of Startup Battlefield, Alfred, is another layer on top of the service industry. It’s an Uber for butlers, maids, and other in-home services and errands. Is Alfred really a necessary invention? Sure, the branding statement says “Come Home Happy,” but what does having someone else get my groceries to do to save climate change or cure infectious disease? That would help me come home happy. Unrealistic, sure, though hopeful. These new startups aren’t solving big problems at all. They’re solving first-world problems. They’re like trickle-down problem-solvers for over-privileged societies – maybe if my house is clean and I starch my collars, I’ll have time to research clean-water solutions for impoverished rural villages. But that can wait until after I get my latte and play some of the latest video game I downloaded for my console while I slept last night on a clean bed made by a housekeeper. The comic posted along this article here pokes a little of fun at this trend in startup culture. Layers of unnecessary cruft on top of things that over 90 percent of the world has no chance of ever using. It might seem like I’m being cynical here, but at Float, it’s clear we’re not the only ones thinking like this. Take venture capitalist Mark Andreessen’s recent Twitter rant from September about startups’ high burn rates and the vaporization they experience when they can’t gain traction for their weak ideas. Not only are the ideas weak, but the leaders of these companies are also spending money like drunk sailors on leave. 4/When the market turns, and it will turn, we will find out who has been swimming without trunks on: many high burn rate co’s will VAPORIZE. Add Dr. Neil deGrasse Tyson to the list of people scathing over what problems startups are solving. “Society has bigger problems than what can be solved with your next app,” he said in a recent keynote. These are problems not solved by an app built in the garage. Instead, problems related to climate change, lack of funding in schools, lack of real scientific research and many other societal woes all seem to be at the top of Dr. Tyson’s mind. The award-winning astrophysicist, author and a host of numerous science-related television programs and podcasts is the featured keynote speaker next week in Las Vegas at DevLearn. He recently sat down with guild’s program director David Kelly and had a 20-minute conversation previewing the talk. Here at Float, we agree with Dr. Tyson’s push to make science and education a priority in your life, and for that matter, your company’s existence. Help foster a culture of curiosity, questioning and seeking the answers that will propel us forward through the next century. 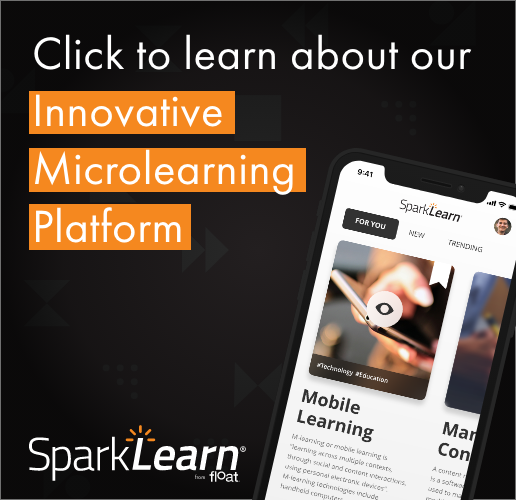 Come join us at DevLearn. Stop by the Float booth (#508), and see what we’ve been doing to change how learning gets done in businesses and schools today. We might not help you save the polar bears, but we’re doing our very best to change things we have control over. We’ve written books on the changing face of learning. The latest one, Mastering Mobile Learning, was just released and is available now. Our mobile learning apps have been downloaded more than 300,000 times by schools, educators and trainers alike. Forbes even said our mobile apps would help make your business more productive. We want to think that what we’re producing is making some small bit of a difference in how people talk, communicate and collaborate when at work, school or just learning on the Web.